With not one but six First Friday art walks each month, Denver has enough galleries, studios and museums to satisfy the most voracious art lover (and enough restaurants, food trucks, bars and breweries along the way to fill the hungriest belly). Don’t let the industrial vibe fool you. 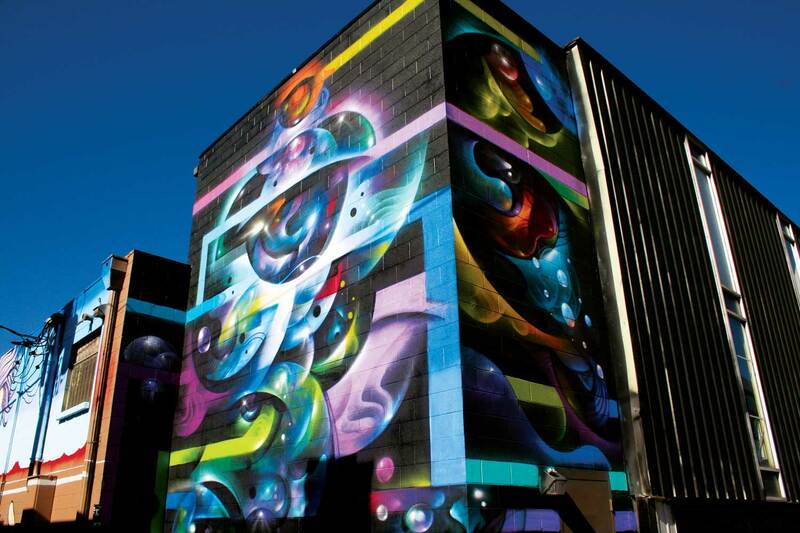 River North — or RiNo — is one of Denver’s artiest neighborhoods. Start on the Brighton side at Plinth Gallery, which features work by contemporary ceramic artists, or at Weilworks, the studio and gallery of painter Tracy Weil, one of the co-founders of the art district. For lots of art under one roof, stop into Helikon Gallery & Studios, which houses two gallery spaces and 14 artist studios, or The Dry Ice Factory, a community of 22 art studios, 10 ceramic studios and the Ice Cube and aBuzz galleries. Visit painter Sharon Brown at her home studio in The Pattern Shop, or take in a glass-blowing demonstration at Blake Street Glass Studio. RiNo is also an incubator for Denver’s craft beverage industry, and these worlds collide on First Fridays, with Stem Ciders, Infinite Monkey Theorem winery, and breweries like Great Divide, Black Shirt Brewing and Beryl’s Beer Co. doubling as art galleries. Hungry? Duck into food hall Zeppelin Station to snack on everything from Vietnamese banh minh to Montreal-style smoked meats. Best Art Walk For: Pairing art and beer (and wine and cider). First Friday: 5:30–9:30pm; also offers a Third Friday Collector’s Preview event each month. Hop aboard the free bus that loops this district to take in Denver’s largest art walk, boasting more than 100 artist studios, galleries, shops, bars and restaurants. Start your night on the west end of the district at Brewery Bar II, where anything on the menu that comes with a side of their famous pork green chili is worth ordering. Walk across to street to take the shuttle around the loop to wander five blocks of clustered studios and galleries, including the Access Gallery, a non-profit featuring artists with disabilities; and Artists on Santa Fe Gallery, with its brightly painted façade. Book lovers won’t want to miss Abecedarian Gallery and its focus on book arts and printmaking, while Francophiles will find Alliance Francaise Gallery on Sixth and Galapago well worth the short detour. Best Art Walk For: Hitting as many galleries as possible in one night. Denver’s oldest art walk, on Tennyson Street, hails from the historic Berkeley neighborhood and is a decidedly family affair with street performers and food vendors on every corner. Nature lovers will marvel at ultra-magnified digital photos of leaves, flowers, fruits and stones at the Kirk Norlin Studio, or get your pop culture fix from Ryan Rice’s color-saturated paintings inspired by film and advertising at R2 Studio and Gallery. If you’re feeling crafty, head to evb•studio, where clay artist Marie E.v.B. Gibbons offers hands-on “minishops” on First Fridays; visitors can make their piece for just $10. Best Art Walk For: Music lovers. Street musicians perform during the warmer months, plus you can catch a concert at the Oriental Theater after the galleries close. South Pearl is best known for its excellent restaurants and farmers’ market, but it’s also a great place to find accessible art. Start your walk near the intersection of Buchtel and South Pearl at Sand Dollar Gallery. Inside the little blue house you’ll find watercolors from artist and owner Nancy Condit, as well as jewelry, ceramics, stained glass, ornaments and cards. As you head south through the neighborhood, visit Gallery 1505 for fine jewelry and ceramics, stop into the Colorado Potters Guild to watch artists work their magic at the potter’s wheel and browse Bell Studio Gallery’s oil paintings, stained glass, sculptures and jewelry, much of it inspired by the American West. Once you’ve worked up an appetite, stop for a slice on the charming patio at Kaos Pizza, grab at taco at Uno Mas or indulge a craving for Japanese cuisine at Sushi Den or one of its nearby sister restaurants, Izakaya Den or Ototo. Best Art Walk For: Foodies who consider art the perfect appetizer. Golden Triangle is Denver's civic and cultural hub, but it’s also a hot spot for the arts. After all, it’s home to the venerable Denver Art Museum and the Kirkland Museum of Fine & Decorative Art, which was recently relocated to the neighborhood. Get the lay of the land on the rooftop patio at The Fainting Goat Pub, then work your way clockwise around the district, starting with the William Havu Gallery, which showcases contemporary art by Colorado and Southwest artists in an award-winning, post-modern building. In the market for home goods? z|modern features vintage modern furniture, funky lighting and decorative arts. Finally, take in comtemporary exhibits in a captivating space at Walker Fine Art. The district’s renowned museums also get in on the Final Friday fun. The Byers-Evans House Gallery hosts a reception from 5–9pm, and the house, a historic landmark, is open for guided tours. The Clyfford Still Museum is also open during the art walk. Still’s works of abstract expressionism were sealed from public view for more than 30 years before the museum opened in 2011, so it’s a treat to view them for free. Best Art Walk For: Getting history buffs to tag along. Denver city limits don’t have a monopoly on art walks, and 40 West Arts District and Block 7’s First Friday events in Lakewood are a testament to the fact. 40 West Arts District is a Colorado Creative District located within the historic West Colfax Corridor with more than 20 public art installations and dozens of creative enterprises a short drive from downtown Denver. The 40 West Arts Gallery on Teller Street, which houses the works of painters, glassblowers and other local creatives, hosts an opening reception every First Friday. Look for the ArtLine, a new 4-mile walking and biking arts experience that connects the district’s parks and artsy destinations. Located in the nearby Belmar Shopping District, Block 7 is home to a handful of working studios and galleries. True Colors Studio & Gallery specializes in original oil paintings and oil pastels of Colorado nature, while Valkarie Gallery mixes contemporary art paintings, photography and book arts. Looking for something a little out of the ordinary? Head to DiagnosisART, where artist Penny Oliver displays acrylic paintings based on the anatomy of the human body, or admire Anne van Leeuwen’s handcrafted paper sculptures at her eponymous gallery. Best Art Walk For: Families. 40 West Arts District has several fam-friendly dining options — including Casa Bonita, a local legend with cliff-diving shows all-you-can-eat sopapillas. And Belmar Shopping District has a bowling alley, movie theater and (in winter) an ice-skating rink. Find art walks all over Colorado.